Another reason I love this weekend: the perfect balance of me time + friend time + zero grad school time! This teeny serving was perfect to fuel me up for Saturday morning’s hot yoga class. After yoga, I tore back down to Brooklyn to pick up the CSA. Kate is out of town this weekend, so I was responsible for getting the whole share. After the photo shoot, I split everything in half so Kate can come collect her stuff on Tuesday when she’s back. Once all of the produce was sorted and processed, I put together mini-breakfast part 2, this time with 1/3 cup of scary-weight-management-powder-turned-delicious-vanilla-yogurt-chia-goji-pudding. 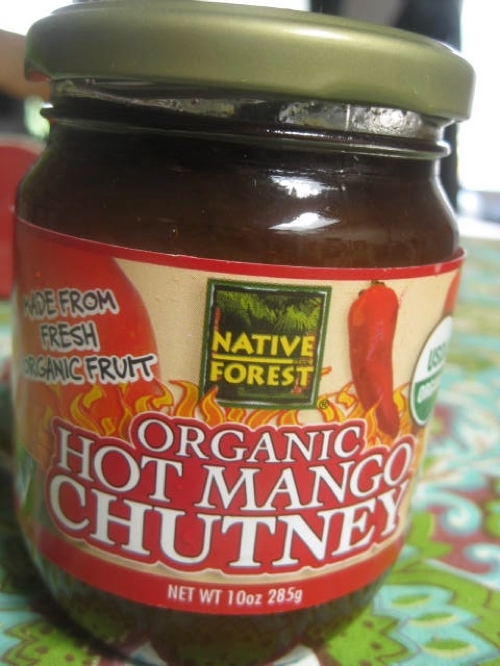 On the side, I sliced 1/4 of the chayote from Friday night and dipped it into this organic hot mango chutney from Native Forest. The chutney was pretty pretty hot, so it paired perfectly with the refreshing watery crunch from the chayote. Shortly thereafter, it was time to head out for the social segment of the day, along with some good old-fashioned 4th of July festivating! What do you crave more on weekends: solo time or social time? A mixture of solo and social time. But I’m more of a solo person, so that’s the part I enjoy most. I like spending all day Saturday shopping by myself and then doing this with hubby and/or friends at night. i like the balance of both! too much of either can be overwhelming! this weekend i had me time thursday nite and then friend time friday and saturday and now me time on sunday!!!! i love ending the weekend with some good book reading and getting my life back together. looks like you had a great 4th!!! Rainbow chard! I call them dirt Skittles. . . .Def a mix of solo and social. Typically solo at home (so I can fold my underwear) and social while out. Happy Fourth!! Depends! Right now most of my work is from home so by the weekend, I need socialising. When I have had jobs working 14 hours straight surrounded by people, I want nothing but silence at the weekend! Basically, if I have solo time, i then crave social time and if i have social time, i crave solo time. I like solo time for some odd reason.. haha! I like a little bit of both. If I don’t get SOME solo time though, I get a bit cranky. I need time to just get things done and I can only do that alone!